Best known for their Barbie and Friends products, they had many baby type dolls, toys and wonderfully innovative products that have enthralled many a child and continue to captivate adults with their collector dolls and many products over the years. 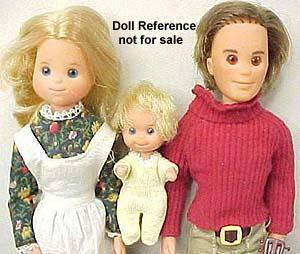 See below for Mattel 1970s dolls identified. 1959-Present Barbie doll Family & doll Friends, various sizes, see Barbie Dolls 1959+ for details. Barbie dolls are of course still produced today, see this page for modern Barbie. 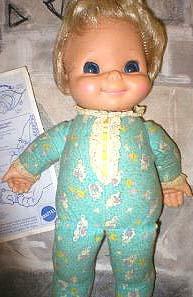 1970 Mattel Baby Love Light doll, 20" tall, stuffed one piece cloth body with plastic head and limbs, rooted blonde hair, big blue eyes that light up when you closed her hand around your finger, battery operated with opening in dolls bottom, wearing turquoise blue cotton printed pajamas with a lace placket and lace collar. 1970 Baby Love Light doll, 20"
1970-1975 Mattel Baby Tender Love doll, 20" tall, toddler body, one piece soft plastic stuffed body, rooted blond hair, open mouth. Unsure if shown in original outfit. See the other Tender Love dolls from this series. 1970 Baby Tender Love doll, 20"
1970 Mattel Hedwig doll, a Dr. Seuss character, talking doll, one piece cloth stuffed body and head, yellow yarn hair. 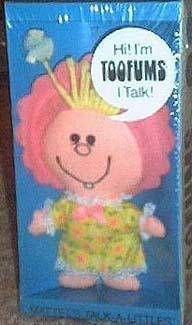 1970 Mattel Talk a Littles Toofums doll, 6" tall, pull string talker, cloth stuffed body with pink fabric hair, painted on face with one tooth showing and freckles, yellow print dress with lace trim. 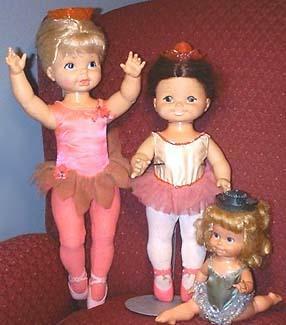 There must have been a series of these dolls as Amy Sayler has sent a photo of Talk a Littles - Hi I'm Toofums, I talk! Amy tells us this was the "baby" of the bunch and it says "I want a hamburger" among other things. Photo courtesy Amy Salyer. 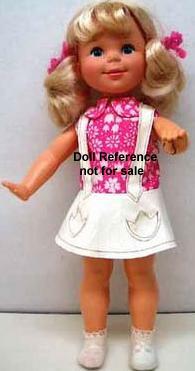 1970 Mattel Shopping Sheryl doll, 15" tall. 1970 Shopping Sheryl doll, 15"
1971 Mattel Big Jim doll or Mattel Big Josh doll, (shown on left) both dolls are 9 1/2" tall, all plastic and vinyl with painted facial features and molded hair. 1971 Big Jim doll, 9 1/2"
1971 Mattel Cynthia doll, 18 1/2" tall, all vinyl, painted facial features, blue eyes, rooted blonde hair. 1971 Cynthia doll, 18 1/2"
1971 Mattel Grizzly Adams doll, 10" tall. 1971 Grizzly Adams doll, 10"
1971-1974 Mattel Rock Flower dolls, 6 1/2 -7" tall, Dolls were; Heather (long blonde hair), Lilac (light brown hair), Rosemary (black hair), Iris and Doug. Came with a 45 rpm record. See the Rock Flower doll page for details. 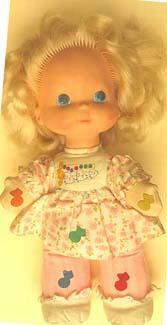 Note: Rock Flower doll clothes are often confused with the Dawn dolls by Topper Toys, who are the same size. 1971 Mattel How the West Was Won dolls, 10" tall, shown is the Lone Wolf doll. 1971 Lone Wolf doll, 10"
1971 Mattel Talking Twin Kip doll, 12" tall, vinyl and cloth, rooted hair, two upper and lower teeth are showing, talker, marked: 1967 Mattel Inc, Japan. 1971 Talking Twin Kip doll, 12"
1971 Mattel Talk Up's dolls, 4 1/2" tall, have bodies that could be pulled away from their heads to make them talk. Their facial features are paper pasted on plastic heads. The Talk Ups included Silly Talk (brunette doll), Funny Talk (blonde doll), Dressy Talk (doll with orange hair who came with seven different dresses). In addition, there were cartoon characters made into Talk Up dolls including; Casper the Friendly Ghost, Donald and Daisy Duck and Mickey and Minnie Mouse. 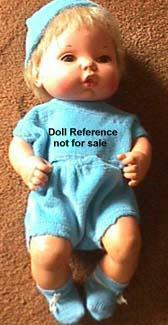 1971 Talk Up's dolls, 4 1/2"
1972 Mattel Baby Brother Tender love doll, 12" tall, white or black doll, anatomically correct doll, marked with a date 1972 on neck and body. Believe he is shown in original outfit. 1972 Baby Brother Tender love doll, 12"
1972 Mattel Baby Dancerina doll, 12" tall, wears the green and silver tutu, in photo at bottom right, see also the Mattel Dolls 1960s page for the other dancerina dolls. 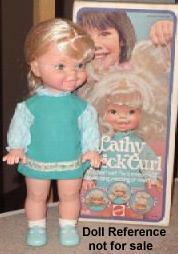 1972-1974 Mattel Cathy Quick Curl doll, 15" tall, rooted blonde hair with copper wires that help to hold the hair setting, blue eyes, came with hairbrush and curlers. 1972 Cathy Quick Curl, 15"
1972 Mattel Fashion Teeners dolls, 4" tall, looks like a mini Barbie, glued on hair rather than rooted, came wearing a plastic swimsuit with additional clothing on a cardboad hang tag with bubble front. 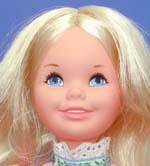 Names were; Coreen, Doreen, (blondes) Loreen (brunette), and Moreen (redhead), dolls are marked on back © 1971 Mattel. These are VHTF. Shown on left is Doreen Fashion Teeners. 1972 Mattel Peachy doll and Her Puppets doll, 17" tall, hard bodied pull string talker, rooted blonde hair, wears a yellow dress, came with several puppets; a dog, bear unsure of the others. 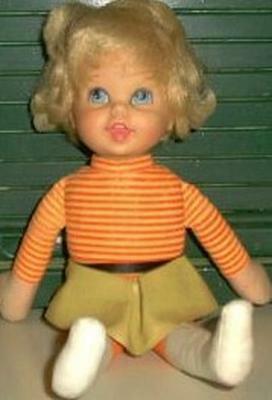 1972 Mattel Saucy doll, about 16" tall, baby type hard plastic and vinyl, rooted blonde curly short hair, blue sleep eyes with lashes, makes about eight different faces when her left arm is moved in a circle, think she was dressed in a pink sun suit with pink and white check inset at neck. 1972-1975 Mattel Tiny Baby Tender Love doll, newborn doll 13" tall. 1972 Tiny Baby Tender Love doll, 13"
1973-1975 Mattell Baby Beans doll, 12" tall, vinyl head, bean bag doll body, talk or non-talk, there were many dolls in this series; Mama doll with baby, Biffy Beans boy doll and others. 1973 Baby Beans doll, 12"
1973 Mattel Pedal Pretty doll, 15" tall, stuffed cloth body, vinyl head with painted facial features, orange yarn hair. Shown in original outfit. 1973 Pedal Pretty doll, 15"
1974 Mattel Baby Love Notes doll, 10" tall, stuffed cloth body, vinyl head with rooted hair, their are various dolls in this series each with it's own clothing, heads are marked: ©1974. 1974 Baby Love Notes doll, 10"
1974 Mattel Baby That-a-way doll, about 15" tall, vinyl head with short rooted hair, painted facial features, painted blue eyes, jointed plastic body, battery operated crawling doll, dressed in a hot pink sun suit with white lace trim, head and body marked: 1974. Dressed in a red sun suit in 1982. 1974 Baby That-a-way doll, 15"
1974-1978 Mattel Sunshine Family dolls; white dolls, Dad - Steve 9" tall, Mom - Stephie 9" tall, daughter Baby Sweets 3" tall, and the Grand Parents both, 9" tall. See the Sunshine & Happy family page, also came as black dolls or Italian dolls, probably other nationalities too, but these are all we have found. 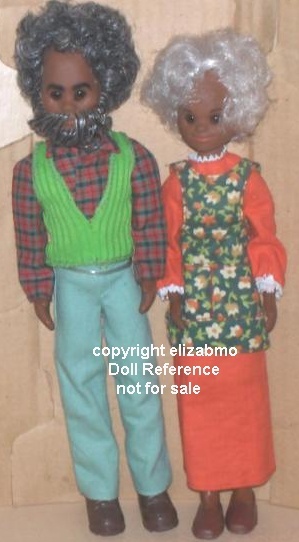 Grandma and Grandpa Sunshine were also sold separately from the "main" family. 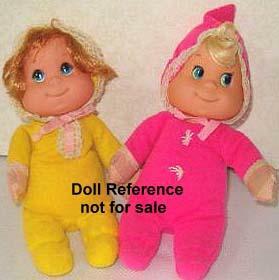 In the last year they were produced, 1978, a new version was released where Baby Sweets had "Grown Up" to be a little girl doll and she now had a little brother (same mold as before). ca. 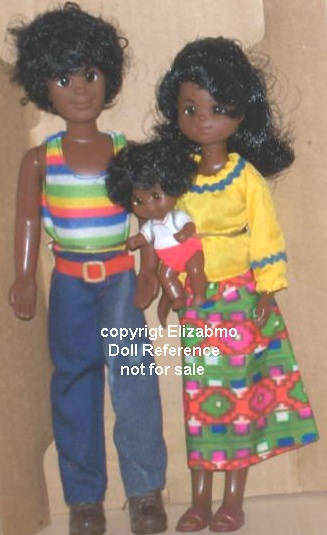 late 1970s - Mattel The Happy Family dolls- were the black friends of the Sunshine Family using the same molds. Just like the Sunshine Family, they originally came with Dad (Hal), Mom (Hattie), and Baby Hon. The Happy grandparents were also sold separately. Also like the Sunshine Family, Baby Hon grew up to be a little girl and got a new baby sibling in 1978. The little girl versions of Sweets and especially Hon are probably the hardest to find of the Sunshine Family line because they were only produced for about a year. The information and photo's is shared by Elizabmo, Thanks for sharing! 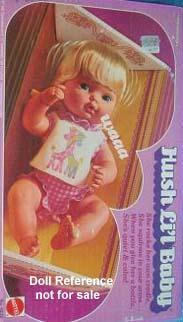 1975 Mattel Hush Lil Baby doll, 15" tall, battery operated talker. 1975 Hush Lil Baby doll, 15"
1976 Mattel Baby Come Back doll, 16" tall, vinyl head with short rooted blonde hair, painted facial features, brown painted eyes, closed mouth, jointed body. 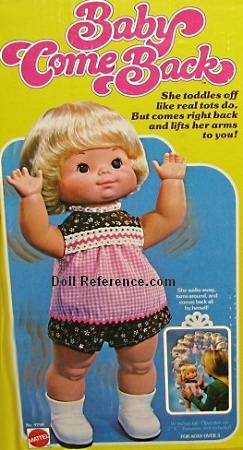 Battery operated walker doll, that walks away from you and then comes back and then raises her arms up. 1976 Baby Come Back doll, 16"
1976 Mattel Star Spangled dolls; "Beautiful People and Moments in History Series", New England Girl, #7940 Pioneer Girl - Sara Jane Benson, Southern Belle, (used the Sunshine family adults) marked 1973 Made in Taiwan. 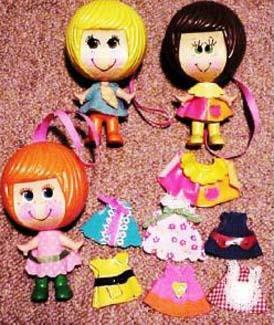 1976-1978 Mattel Honey Hill Bunch dolls, 4" tall, cloth dolls with vinyl heads and rooted hair, on one of their hands is a piece of velcro so they could carry their accessory. 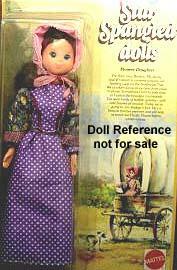 Dolls are: Darlin, Hayseed, I.Q., Little Kid, Slugger (or Battie), Solo, Miss Chevus, Sweetlee, Curly Q, Irish Eyes, Spunky, Sunflower, Rickety Rig and the dog Chum. 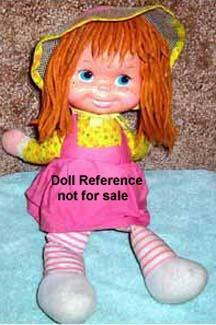 See the Honey Hill Bunch doll page for more details. 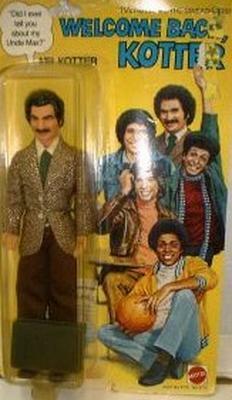 1976-1977 Mattel Welcome Back Kotter dolls, (high school teacher character played by actor Gabe Kaplan) 9" tall dolls, several character dolls from the TV show Welcome Back Kotter, on air 1975-1979. Other Kotter characters were Sweathogs; Vincent Vinnie Barbarino (actor John Travolta), Juan Luis Pedro Philippo DeHuevos Epstein (actor Roger Hegyes), Arnold Horshack (actor Ron Palillo), Freddie Boom Boom Percy Washington (actor Lawrence Hilton-Jacobs). 1976 Mr. Gabe Kotter doll, 9"
1978 Mattel Baby Grows Up doll, 16-18" tall, pull string makes the doll grow from an infant to a toddler, and each has a set of clothing. 1978 Baby Grows Up doll, 16"
1978 Mattel Charlie's Angels dolls, 11 1/2" tall, from the 1970s TV show, actress's were: Farrah Fawcett, Kate Jackson, Sheryl Ladd and Jaclyn Smith. 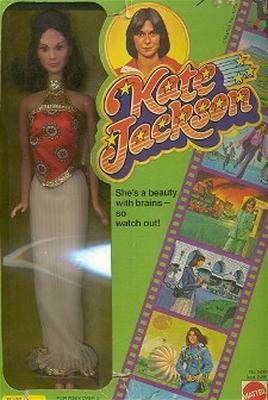 1978 Kate Jackson doll, 11 1/2"
1978 Mattel Debby Boone doll, 11 1/2" tall, celebrity recording star, actress and author. Best known for her 1977hit record - You Light Up My Life. Debby is the daughter of Pat Boone and Shirley Lee Foley Boone. 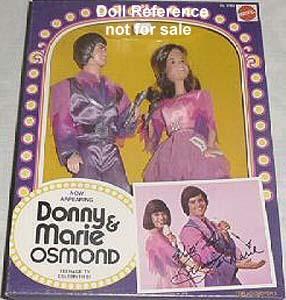 1978 Debby Boone doll, 11 1/2"
1978 Mattel Donny Osmond doll or Marie Osmond doll, 12" tall. 1979 Mattel Jimmy Osmond doll, 10" tall. 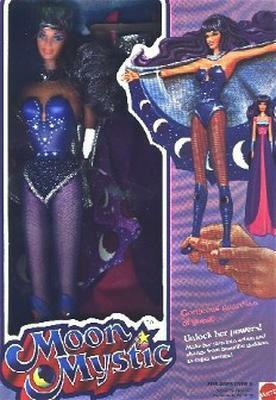 1979-1980 Mattel Guardian Goddess dolls, 11 1/2"-12" tall, Moon Mystic and Sun Spell, arms go up and down, costume comes off to reveal a Super Girl outfit. Separate outfits were also available. HTF. 1979 Moon Mystic doll 11 1/2"
1979 Mattel Gorgeous Creatures Princess Pig doll, 7 1/2" tall, all cloth stuffed body, dressed in a pink formal gown with big picture hat, black fishnet stockings & black high heel shoes. 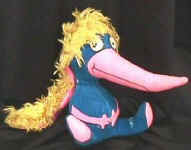 1979 Princess Pig doll, 7 1/2"
1972 Mattel Kiss N' Tell doll, 15" tall, cloth stuffed body, talker doll.